Boston Handmade member Diane Ivey of Lady Dye Fiber Arts knitting and showing her work at the 2013 Boston Handmade Somerville Marketplace. 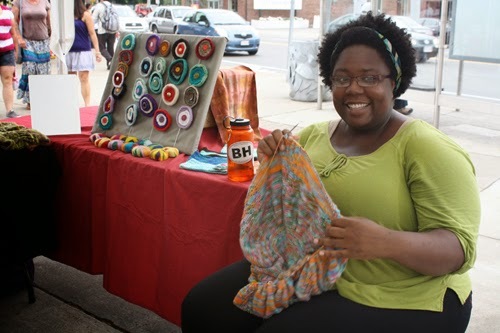 Since 2007 Boston Handmade has been connecting local artists and craftspeople, encouraging dialogue, and harnessing the power of many to strengthen the success of each creative individual. By bringing together arts professionals in all stages of their careers working in a wide variety of mediums, we learn from one another and broaden our overall creative experience. As a group, the membership of Boston Handmade is dedicated to working collaboratively for mutual inspirational and professional benefit, regularly producing exhibition and educational opportunities for one another and the greater Boston community. As individuals, our members are committed to succeeding as professional artists, creating their original work by hand in small studio environments.